Hot Hugs make ideal bedtime Hotties, their warmth and relaxing fragrance help soothe, comfort and aid restful sleep. Hot Hugs are made with the highest quality supersoft fabrics and contain an easily removable Cotswold wheat filled tummy insert. The tummy insert has been infused with lavender and camomile pure essential oil to help soothe and calm at bed time. Simply heat the insert in a microwave to enjoy a lovely warm cuddle. As well as being great huggable hotties they also make terrific toys. The fun packaging makes them a perfect gift, surely everyone would love a Hot Hug? Essential Oil: Fragranced with calming Lavender and Camomile pure essential oils.. Caution: Hot Hugs are not suitable for children aged under 3 years old. These come neatly gift packaged making an ideal gift for your loved ones, friends and family. Only clean with a damp sponge or a dry brush, do not immerse in water. In time the aroma may need replenishing, add a few drops of pure essential oil to the wheat filled inner cushion after heating. 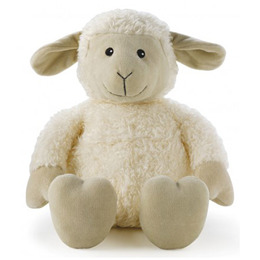 Below are reviews of Aroma Home Hot Hugs - Lamb by bodykind customers. If you have tried this product we'd love to hear what you think so please leave a review. Just heat up your Hot Hugs to enjoy a lovely warm cuddle. They are scented with calming lavender and chamomile pure essential oil to help soothe, comfort and aid restful sleep.